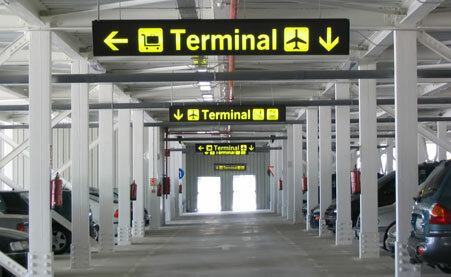 After last works carried out at Malaga airport, there are 4 public areas where you can park your car, depending on your needs. On the other hand, you can use the service of a private company, which usually provide a better service and cheaper rates. In addition to car hire and transfer services, this company also provides parking facilities. Totally insured indoor and outdoor parking. Free transfers from/to the airport, located just 2 minutes away from their parking lot. This one should be used for long term parking. It costs around 4,50€ per day. On the other hand, it’s located 5 minutes away from the airport by car. There is a courtesy bus every 15 minutes (may be very busy during high season). This one costs around 18 euros per day. You can get to the airport in 3 minutes by foot. Just like the P1, it costs 18 euros per day but it is closer to the airport, around 1 minute by foot. Otherwise, it can be very difficult to park your car here in high season. Please take care, it is very easy to leave your car at the Express Parking lot by mistake. It is very expensive, around 35€ per day. One minute walk to the terminal. Just advisable when you need to pick-up someone that is already waiting at any of the airport exits. Around 15€ per day, with a minimum of 45€. They provide free exterior washing when parking your car for 4 days or more. No delays, parking at the terminal. You can check prices online at AENA’s parking website.